LEGO Star Wars: The Force Awakens is a videogame featuring the complete storyline from the epic blockbuster film, Star Wars: The Force Awakens, retold through a clever and witty LEGO lens. The game also features playable content exploring previously untold adventures set in the time leading up to Star Wars: The Force Awakens, as well as original dialogue from key members of the theatrical cast, providing the most authentic Star Wars experience for players, including Harrison Ford (Han Solo), John Boyega (Finn), Daisy Ridley (Rey) and other top stars from the film. LEGO Star Wars: The Force Awakens is available now for PlayStation 4, PlayStation 3, PlayStation Vita, Xbox One, Xbox 360, Wii U, Nintendo 3DS, Windows PC (Steam), Mac (Steam), on the App Store for iPhone, iPad, iPod touch and Mac and on Google Play for Android devices. LeapStart is an interactive activity learning system for kids that teaches core school and life skills. It’s jam-packed with activities for children ages 2-7 yrs. old. Gets kids excited about everything from counting to creativity, and phonics to problem-solving with replayable activity books bursting with fun. Bubble Science Kit by Thames & Kosmos available at LabRatGifts.com, the world’s largest science-themed gift store. Experiment with fascinating soap bubbles to learn physical science fundamentals in a fun way. 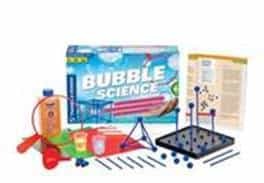 Blow giant bubbles, mini-bubbles, bubbles within bubbles, chains of bubbles, and bubble blankets with the Bubble Science Kit. Learn about the love-hate relationship between soap and water, and the scientific phenomenon of surface tension. Fuzzy Flyers to the mix. They are soft lovable toys that encourage kids to be active. Energetic kids will love Fuzzy Flyers, two fuzzy characters (Coco & Chirpie) that will motivate kids to turn the tablet off and play. The fuzzy flyers are a cohesive blend of electrical, mechanical, and industrial engineering with some programming that ties it all together. They have Motion sensors to tell if they are being tossed, thrown, or shaken, have interactive features and embedded game play. Play “Dance Party” with Coco and learn cool dance moves, “Sky Bird” with Chirpie where players have to keep Chirpie in the air, or surprise a friend with “Bark Attack”, Coco won’t stop barking until someone catches him. 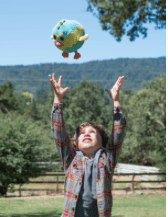 Coco and Chirpie are affordable at $29.99 and a great way to motivate kids to play on their own or with a sibling/friend to encourage teamwork and social interaction. Arckit is a creative, freeform model building system (see images below) that is opening the world of architecture to everyone. Kids call it “Reality Minecraft” and adults call it “Legos for Grownups.” The result is a beautifully built model you don’t mind displaying in your home OR you can build over and over again with the high quality components. For those who want to take their design to the next level, Arckit is also integrated with popular CAD programs – FREE online access to Arckit Digital components within SketchUp 3D Warehouse and Autodesk Revit allow users to create digital models and then build with their kits. Here’s an example: https://sketchfab.com/models/748b5317ca6c4ffb960d2299f6bef209. A fun way to learn design skills early on. Large floor plates and easy “click and connect” components make this a perfect starter set for younger architects. Go Plus offers exciting new components and adhesive sheets that allow users to complete models and very realistic building finishes. With 170 pieces and 5 Arckitexture preprinted adhesive sheets, decorating your building with cool surface details adds a whole new level of play. Each of these kits contain special components to build with curves, angles and/or dormers. 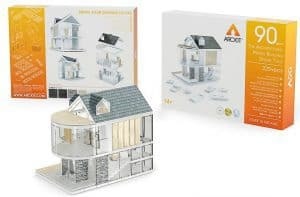 These smaller sets with 115 pieces are perfect as a stand along kit or as an advanced addition to any Arckit set. With 220 pieces, Arckit 90 immerses users in the ultimate Arckit experience. Everything model makers need to build a diverse range of impressive structures up to 90 sq.m/960 sq.ft to scale is found in this kit. FlipaZoo (Jay at Play), is a super-sweet and cuddly-soft collection of character plush with each doubling as a pillow for naptime, playtime and family travel. The adorable new FlipaZoo line features more than 12 standout FlipaZoo characters that magically transform from one animal to another – and then easily flip back again. 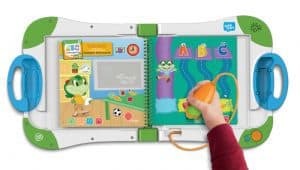 With the new line’s patented one-of-a-kind “easy flip” designs, little ones can simply hold their favorite two-sided FlipaZoo friend, “flip” its soft back, and instantly reveal a totally new FlipaZoo! ($19.99 each, for all ages). Available are: Giraffe/Hippo, Cat/Mouse, Unicorn/Dragon, Elephant/Tiger, and Husky Dog/Polar Bear. Debuting exclusively at Walmart this holiday season will be Grizzly Bear/Alligator and Bulldog/Tabby Cat. For double the fun, consumers who purchase any FlipaZoo on the official website will receive a FREE “Little Flipzee” for pocket-size flipping fun. Ready to be tucked under the tree this year are brand new toys from Just Play based on Fremantle’s fan-favorite Kate & Mim-Mim. These include the Kate & Mim-Mim Magic Twirl Mim-Mim, a large plush version of the purple funny bunny that kids can twirl around just like on the show. He also says 10 fun phrases (SRP $19.99). Other offerings include Kate & Mim-Mim Adventures with Kate Doll, a beautiful 8.5” doll dressed in her signature adventure outfit (SRP $12.99); plus collectible figures, beanie plush and surprise bags. Chuckle Ball®, a self-rolling bouncing toy for ages 18 months+. This delightful “goof ball” with zany 3D characters in bright eye-catching colors captures a child’s attention. Silly sounds keep kids captivated and a chunky feel makes it easy to grip. Shuts off automatically and then instantly comes back to life once it’s shaken again (SRP $19.99).